Let’s be honest, Mario’s recent tennis antics aren’t what they used to be. What was once a series enjoyed for its unique take on the much-loved sport has continued to lose a lot of its charm and creativity with each new release – the latest outing Ultra Smash, being arguably the lowest point yet. Then Nintendo announced Mario Tennis Aces with its initial trailers teasing the promise of a return to form for the plumber. While still cautiously optimistic, a couple of hours in the game’s online tournament demo would only serve to further my excitement. Now I’ve gotten some time with the full release, has Camelot served us an ace or is it just another double fault? 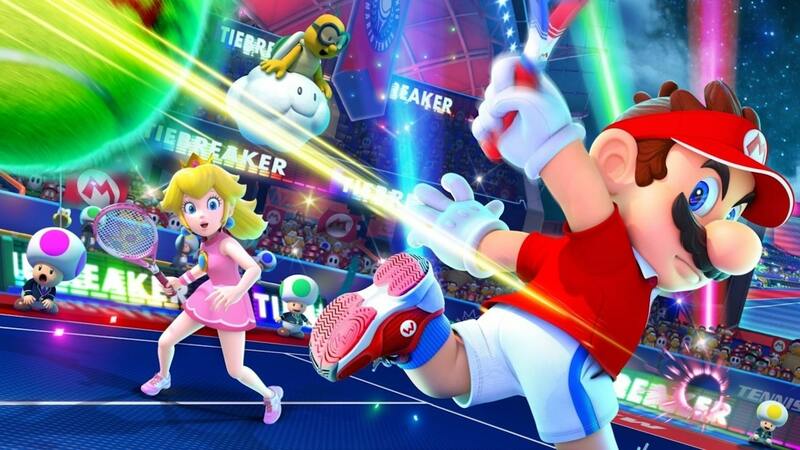 Sixteen characters make the cut for Mario Tennis Aces each with their own pros and cons (Yoshi is fast at the expense of shot power, Bowser hard-hitting but slow on his feet and so on) and they’ve never looked better. The expected veterans return with some surprising new additions including the giant chain chomp and Spike. The roster is still missing some key players at the moment but that should be sorted with free updates further down the road. At its core, the game mechanics here should feel very familiar if you’ve played any past Mario Tennis titles. All your usual shot types like topspin, slice and lob are still assigned to the face buttons with longer prepared wind-ups unleashing more powerful hits. These basics we’ve come to expect from the series still feel great, but it’s what Camelot have added that truly elevates Mario Tennis Aces above the competition. An energy gauge slowly fills with every swing, longer charges yielding bigger chunks of meter and the all-new Trick Shots awarding more still. These latter moves require precision timing as your player leaps, slides or spins their way over to the ball in flamboyant fashion. There’s an interesting risk/reward mechanic at play here as these flashy moves may increase your energy gauge handsomely but can also cost you precious points should you misread your opponent. The energy earned can be used for both offensive and defensive moves. Zone Speed slows things down allowing you to reach shots otherwise impossible in real time. Zone Shots let you aim a powerful smash via a first-person view while a character’s Special Shot (usable with a full energy gauge) triggers a neat little animation before letting off an even more powerful smash. Along with these new moves, Camelot has also introduced another way to win a match – breaking your opponent’s racket. Players take two rackets into a match with them, each with a health bar. Every time you fail to return a Zone Shot perfectly, your racket takes damage while Special Shots have the chance to destroy in a single hit. Exhaust your entire supply and you lose the match. It’s a rather interesting mechanic and one that can quickly change the tide of a match following a few effectively placed Zone Shots. It’s a particularly great feeling to be one set down only to then win the match via K.O. It can all be a little overwhelming to begin with, especially with gimmick courts also making a return. Playing on a boat, for example, a centrally planted mast will change the trajectory of any shot that knocks it. While competing atop a snowy mountain will see a horde of Bowser’s minions running across the court and hitting the ball back and forth. They’re chaotic but add some appreciated variety to not only your surroundings but also how matches play out. Of course, you can opt for some simple tennis free of showy moves and gimmicks in free mode if you prefer. Mario Tennis Aces sports a somewhat uneven assortment of game modes catering to both single and multiplayer. Tournament mode is about what you’d expect placing you in a knock-out style contest with seven other AI controlled opponents. Featuring just three cups all singles based and played on a standard court, I found plaything through this to be rather weak. Perhaps one of the biggest and most promising new single player features is the game’s Adventure mode, a Mario-focused story that takes you across a linear world map, each stop offering either a one on one match with another character, a challenge mini-game or a boss battle. Unfortunately, the end result is a rather hollow experience whose individual ideas often feel underdeveloped. Take levelling up Mario for example; a process that’s so gradual you’ll have a hard time noticing much difference in the plumber’s ability. Unlocking new tennis rackets again is all well and good but the difference in gameplay is next to zero. As for the actual events themselves, while they are enjoyable enough, certain types crop up too often, requiring you to do the same thing again only at a harder difficulty or a higher score target. The boss battles fair better, however, being not only challenging but fun too. Reaching the finale though, I couldn’t help but feel disappointed by the whole ordeal. While what Camelot have served us is certainly a step forward for the series in terms of single-player content, it’s clear there’s so much more potential left untapped for something like this. Of course, Mario Tennis Aces is best experienced with friends, the game’s local multiplayer definitely invoking that same devilishly competitive feeling I loved the Nintendo 64 version and Mario Power Tennis so much for. Getting four of you together and battling it out in some doubles action is among some of the most fun I’ve had on the Switch. With players who understand the game’s numerous mechanics, rallies can be both tense and action-packed especially with Zone Speed and Zone Shots coming into play too. Swing mode feels like an extension of Nintendo’s Wii Sports, players using a single Joy-Con to literally swing away. Challenging shots that may have been called incorrectly is a cool feature I’ve not seen in a tennis game before even if it doesn’t pop up as often as I’d like. The different shot types also feel a little fiddly to pull off and it can take some getting used to, but it’s a certainly a neat addition that should appeal to the more casual of players. It’s hard to argue how well Mario Tennis Aces plays, the mechanics bringing a lot of added depth to the well-established formula. However, it’s the surrounding options that disappoint and sometimes even confuse. For example, players cannot simply select a court they want to play on their options limited to random, stadium or a custom-made list. Why exactly? Matches themselves are restricted to a tiebreaker or a short single set and even the number of rackets is permanently stuck to two or off. Also absent is the inclusion of the much-loved Ring and Item match types or even the ability to unlock improved star versions of characters. These are small things but if a little more variety and choice were given, could have allowed for some interesting setups. A single racket would have amped up the tension dramatically while being able to lob a red shell at your opponent or aim through rings for more points would have added that little extra Mario spice the game sometimes feels it’s missing. After my experience with the Pre-Launch Online Tournament yielded a range of good, mixed and bad matches thanks to things like input lag and disconnections I was concerned we’d see the same in the full release. Thankfully that isn’t the case with all my matches being lag free. Options are decent enough allowing you to tackle random players (albeit with restricted settings) and friends in singles or doubles competition and monthly tournaments, which will eventually unlock new characters and outfits. Mario Tennis Aces may well feature the best mechanics the series has seen to date, its new Zone manoeuvres and Trick Shots adding an exciting, madcap layer of depth to the sport. While Adventure isn’t the big single player hook I’d have hoped and some options feel a little too stripped down, it’s the game’s multiplayer that will keep this title a firm favourite for months to come. Golf next please Camelot!